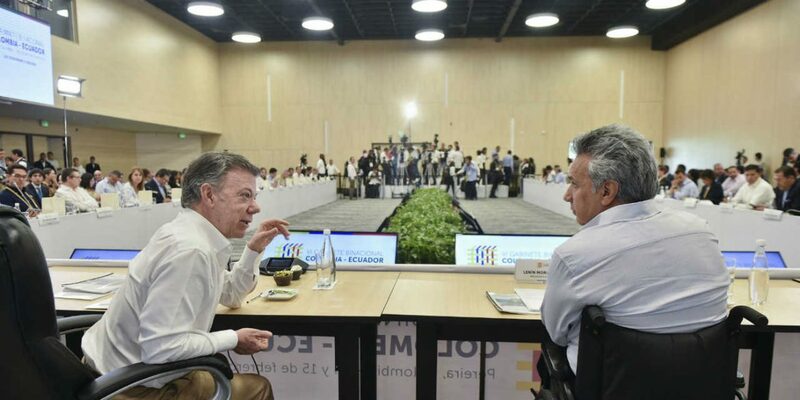 Top officials from Colombia and Ecuador met on Wednesday and Thursday to discuss a plan of action to combat insecurity in the border region between the two nations. The meeting in Pereira, the unofficial capital of Colombia’s iconic coffee region, was the sixth binational cabinet between the two nations. The two governments said they had closed 80 agreements to advance both nations’ economies, infrastructure, and migration issues, with emphasis on border security. According to officials, 75% of last year’s commitments were completed. President Juan Manuel Santos said the countries would strengthen joint actions to prosecute crime within their shared 370-mile border. The officials emphasized strategies against drug trafficking, organized crime, illegal armed groups and dissidents of the now-defunct Revolutionary Armed Forces of Colombia (FARC). Santos announced that his administration doubled the reward for information that leads to the capture of FARC dissident “Guacho,” for allegedly planning a car bomb attack that injured 28 people in San Lorenzo, Ecuador. The rogue guerrilla runs most drug trafficking activity in the border region. Ecuador said they would not increase border troops but strengthen intelligence instead. Colombia recently increased its border presence and has 10,000 troops at the border with Ecuador. Both countries also emphasized a commitment to peace with the National Liberation Army (ELN). Santos thanked Ecuador for their “support and interest” in “opening the opportunity to build peace,” referring to talks held in Quito with the ELN since 2016. This was Ecuador’s President Lenin Moreno’s first binational cabinet meeting and Santos’ last. The first of such meeting was held in 2012 in Tulcan, Ecuador.